I’ve always been fascinated by the story of Dracula. This is due in part to Dracula being based on the historical figure of Vlad Tepes. Dracula’s tale ends up being the fictional continuation of Vlad’s struggles, which are predestined to end in tragedy. With such a rich historical background, few literary characters can match the influence and power of the Count. Dracula’s story has inspired innumerable vampire tales and with good reason. It’s the stuff of legends. The major influences for me in terms of writing I, Dracula were “Bram Stoker’s Dracula” and the “Hellsing” anime. Francis Ford Coppola’s work is the best retelling of Dracula on film. The movie did an amazing job of staying true to the novel, but also in accentuating the love shared by Dracula and Mina. Kouta Hirano’s Hellsing was brilliant in flashing back to Vlad’s past to show the vicious cycles of his existance. Hellsing was also succuessful in finally making Dracula impressive in a contemporary setting. I did my best to honor these influences and I hope this comes across in my work. 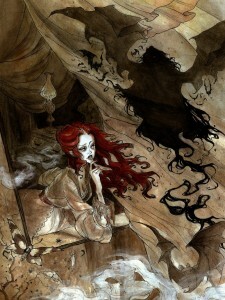 For you Dracula fans salavating over “Dracula Calls” – you can view more of Abigail Larson’s work on her website: www.abigaillarson.com. Feel free to leave me any comments about my work on my fan page.